“Physical activity has dramatic effects on individuals’ physical and mental health,” according to Charles Basch in his report, Healthier Students Make Better Learners. Put simply, educational outcomes are directly influenced by health. This, coupled with the knowledge that the majority of school–age students do not meet the CDC guidelines for 60 minutes of physical activity daily, should concern us all. While we pour money into new, innovative, and different perhaps it would be wiser to shore up what we know works: reinstating physical education and physical activity opportunities in schools. Not only should the physical health risks be a concern, but the findings out of the neurosciences and child development literature continue to make a compelling case for the link between a healthy body and a healthy mind. This literature documents the importance of physical education and physical fitness and their effect on academic outcomes. 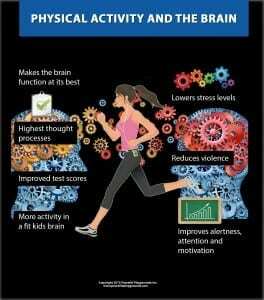 Physical activity (which leads to fitness) may also improve student physical health and well being. Fitness seems to buffer the deterioration of cardiovascular health, bone health, diabetes, and neurological body systems. Physical fitness and aerobic fitness are also associated with mental fitness and emotional health as well. Physical activity affects metabolism and all major body systems. The saying, “A strong mind and a strong body” are now well supported in research. Physical activity affects brain chemistry and cognitive functioning contributing to emotional stability, physical health, and the ability to learn. It is now clear and well supported that physical activity favorably affects cognitive functioning. Three recent literature reviews conclude that school-based physical activity programs may result in short-term cognitive benefits (Taras, 2005), improve cognitive functioning among children (Sibley & Etnier, 2003), and do not hinder academic achievement (Trudeau & Shepard, 2008). These findings support the case for favorable effects of physical activity or physical fitness on cognitive functioning of youth. The CDC report suggested that increased student physical activity and physical fitness can best be achieved through a comprehensive approach (Centers for Disease Control and Prevention, 1997) that includes physical education, wise use of recess [lunch] and after school times, co-curricular physical activity opportunities, and bicycling or walking to and from school. The nature and scope of school-based physical activity/education programs will vary with the resources available (e.g., human, physical, and social environmental) and with the level of commitment by school administrators. Both physical education and lunch have been found to increase physical activity in children. Quality physical education programs are encouraged to organise learning opportunities to ensure that 50% of the physical education experience is organised around physical activity. Recess may be another appropriate time to promote physical activity. Research indicates that lunchtime can contribute significantly to children’s overall levels of moderate to vigorous physical activity. Yet, another type of physical activity opportunities in schools are called “brain breaks.” They are short 5-10 minute breaks within the classroom where students have an opportunity to stretch and move, thus integrating physical activities and academic concepts. The Learning Connection put out by the Action for Healthy Kids Foundation points out many of the academic benefits and what you need to know to ensure your kids are healthy and ready to learn. It’s well known that routine physical activity benefits both body and mind. And there are no age limits. Both children and adults can reap big benefits. A study published in Clinical Psychological Science, a journal of the Association for Psychological Science, explores whether certain factors may help to explain the value of daily physical activity for adolescent mental health. Researchers from the Trimbos Institute in the Netherlands looked at two possible explanations for the link between exercise and good mental health. One was positive self image and the other was winning friends. They surveyed 7,000 Dutch students, ages 11 to 16. Yale University child psychologist Alan Kazdin, the editor of Clinical Psychological Science, says the findings show just how bountiful the benefits of exercise can be. “I think it would be too strong to call it an elixir, but it has the broad effects of something like that,” he says.